1 – What does it mean to be equipped? Do you remember Moses’ story? Read it here (Exodus 3:6-4:17) or watch the video again. 3 – Did Moses trust that God had equipped him? How did Moses respond to God? 4 – How does God respond to Moses’ doubts and fears? 5 – Have you ever doubted yourself? Thought you weren’t strong enough, fast enough, smart enough, nice enough, or old enough to do something? What do you do when you have doubts? Trust that God is always with you. Trust that God has a plan for you. Trust that His plan is good. Trust that He has equipped you for the work ahead. And, go where He leads you. Well, in the end, Moses decides to follow God. I don’t think his fears and doubts disappeared, I think he simply chose to act above them and to trust in God instead. He trusted God and God’s plan for him. He followed the path God set in front of him. Will you follow the path God sets in front of you? Moses is seen as a great leader but, this isn’t perfectly accurate. Moses followed God, God was always the leader. Pray together as a family that God will always be the leader in your lives as well, and that you will trust in Him and follow Him always. This week we are talking about trusting God and His plan for us. This is not something that is easy to do. Just like the person in this video, I don’t want to jump when it doesn’t look safe. But, God knows the plan. God sees things we can’t see. This is why we need to let God lead us, in the good times and the bad times. Read the story of Joseph. If you have the Jesus Storybook Bible, it’s called The Forgiving Prince. Or pick up your Bible and read Genesis 37 and 39 to 45. Or, you can watch this video again. 1. How many brothers did Joseph have? 2. Joseph’s brothers made a very bad decision, what was it? 3. Would you like to be a slave? How would you feel if you were forced to be a slave, far away from home and away from your family? I’m thinking Joseph probably wasn’t super happy and joyful about being a slave, but God was still with him, and Joseph found a way to stay focused on God. 4. Later, Joseph goes to jail for something he didn’t do. Have you ever been punished for something you didn’t do? How did it make you feel? What did you do? Well, even though this other bad, unfair thing happened to Joseph, God was still with him. God won’t stop all the bad and unfair things from happening. Why? Because, God gave us the freedom to make our own choices. This means that we can still make bad choices and other people can still make bad choices. But, no matter what, God will always be with us. 5. Even though bad things were happening, Joseph did not turn away from God. He continued to trust God, he continued to listen to God. Joseph was known for being able to understand dreams. How was he able to do this? 6. What was Pharoah’s dream? What did the dream mean? 7. How does the story end? Was God’s plan for Joseph good or bad? Joseph trusted the promise that God would carry him safe to shore. When bad things happen to you, will you stay focused on God? Will you trust God’s plan for you and trust that God will bring you safe to shore? Would you like to know the future? To know what will happen tomorrow? What will happen next year? Or maybe, you would just like to know if something is hiding in the dark? Or, if you passed your last math test? There are lots of things we don’t know. And, sometimes, it’s scary not knowing. Sometimes, we might worry when we don’t know. Do you ever get scared or worried? What are things that scare you or worry you? Well, I know someone that knows all the answers, He knows everything. And, He has a plan for you. He is going to use all the good things, all the scary things and all the sad things to create you, to shape you. Sometimes He might tell you “wait, it’s not time yet” or “wait, you’re not ready yet”. But, that’s OK, because He knows the plan for you. He knows exactly what you need and when you need it. Do you know who that someone is? Just like the potter, God has a plan. He has a plan for each of us. And, like the clay, we need to be prepared and worked and we will definitely need to wait sometimes, but when we allow God to shape us, when we trust God’s plan for us, we too will be beautiful and strong like the clay. So, the next time you are worried or scared, remember that God has a plan for you and He does not want us to worry. Rather than worry, focus on God. Remember who God is. Remember that God loves us (Ephesians 2:4). Remember that God is good (Psalm 34:8). Remember that God is always there (Psalm 139:7-10). When we remember all these things and we focus on God, it is very difficult not to trust God and His plan for us. (Jeremiah 29:11). Here’s the video of our new song. Teach your parents the actions. Sing the song to help you remember that we can always trust God and that God is always there to show us the way. 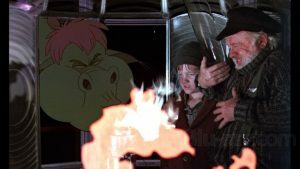 When I was little I loved watching a movie called Pete’s Dragon. It was wonderful. But my favourite part was a scene in the end when a big storm comes and a ship is going to be dashed to pieces on the rocks at the shore. But the lighthouse keeper couldn’t get the lamp in the lighthouse lit! I found it so nerve wracking! Would they save the ship in time? The dragon in the story ended up saving the day, lighting the lamp so it could shine through the storm, and warn the sailors about the rocks ahead. It was so good. Have you ever felt like you’re in the dark and you can’t see what is coming up ahead or know what is going to happen? I bet you have. Talk about a time when you’ve felt lost or uncertain. You and I are so precious to God. We are made with love and care, and God cherishes us deeply. Whenever you start to feel anxious, or worried, or like you’re in the dark, stop and ask God if he’s still there with you. I know what his answer will be. 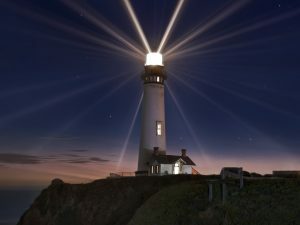 Your Lighthouse will be shining brightly to guide you to him. Then listen to this song again and remember that we belong to God and he’ll never leave us.